Anyways if your in to good sound thru a good equipment playing in a good sounding room, then this is the thread for ya! FiscNad, dragonsdreams, garyinmotion and 1 others like this. My setup's more varied and centers as much around home stereo as it does mobile audio, both current and vintage (Example: I have no less than eight portable CD players and four 'Walkman' cassette players, all of which are operable.) I'm an accuracy freak (which causes me to stray away from tuuuuubes except in my bass guitar rig, LOL) ... and I'm a budget audiophile; I've got some high-end gear, but nothing obscene. What kind of speakers are those, @johan ? Can't quite make out the name on the woofer surround ... ? 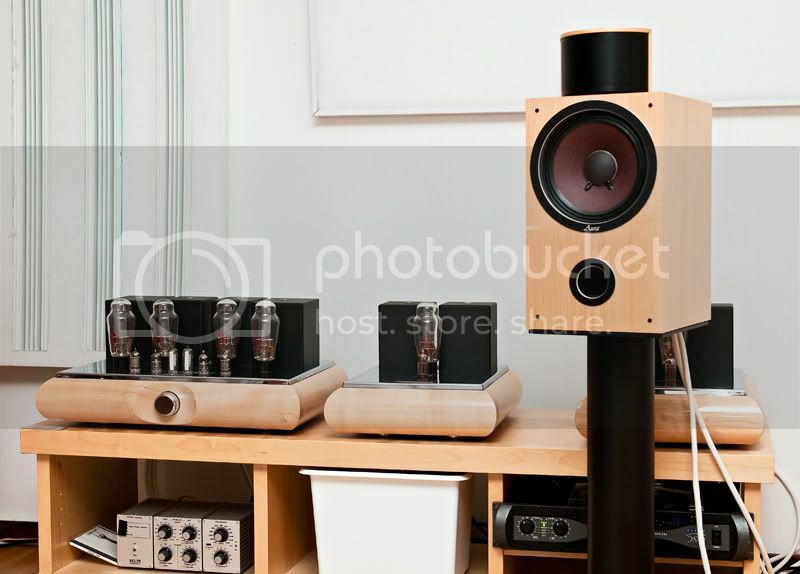 That pic is from a shoot out between JJ Electronic and my setup with Accuphase and Mccormack. The black piece in the front i borrowed until my own unit was built. The models i have is Aura Active and Duo 18. The top tube amps for the tweeters, 10W the black piece on the floor takes the midrange 20W and 4000W QSC to the sub. All handled by System Control 5, thats an Active filter. WLm had a speciall way of thinking, the "head" on the speaker have two tweeters in them, with different angles. The idea is that your gonna use the first reflex on the side wall to create a sound bubble with perfect phase, it works Really well! There is a jigg for that so all the angles are correct. 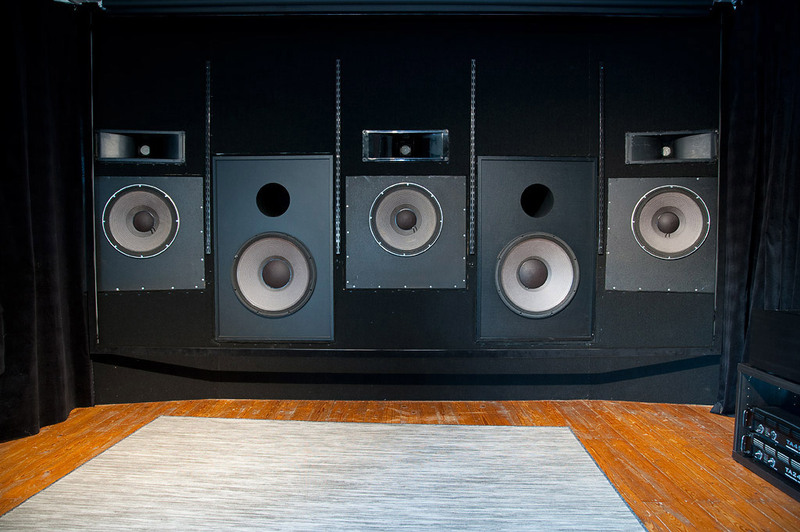 Over all a smooth sounding setup that can knock you of your feet. The sub have two 18" woofers in push pull so even at +120db the cabinet have no vibrations at all. I also have a small home theater, dont look on the floor!! Last edited by johan; 10-10-2018 at 12:12 PM. I have a bedroom system--old stuff; a computer system--really basic; and a living room system that doubles for TV watching. SGR CX4F active speakers--upgraded to current drive, 650 watts/channel (tweeter, mid, mid-bass, 4 bass speakers in each cabinet). And while it's not hi-fi, a commercial lever espresso machine! Music is mostly Jazz, rock, and alternative--all adult-->no kid stuff allowed. But i do like Super low distortion, bottomless dynamics and to be able to play really load without compromising with those things. I sold all my LP:s years back that i regret but my CD collection stays and i also stream via jRiver. I have been doing this since my teens and i am 50 years old so there have been a lot of changes over the years. Also i am part time acoustic consultant, imo the room is just as important as the gear. For those who likes that stuff i have a lot of graphs and numbers. Ascend Acoustics, that was something new for me, you got to love ribbon tweeters! Nice setup - Analog guy and the room! SGR CX4F, that's also something new for me. All my gear uses active xo, i haven't used passive speakers for years. Its a bit harder if your in to DIY and want to have compensation in the filters but its well worth it! I have Audio Research CD 3 playing through Audible Illusion Modulus IIC pre amp into Audio Research VT 50 Tube Amp and out of ProAc Response 2.5 speakers. MIT interconnects and speaker cables biwired. Great spatial image . Base is fine but the midrange sounds great. ProAc most cloned speaker brand there is. Nice hardware @sevencyclist and @johan !!! I'm more of a "budget" audiophile like @Viffermike. In my main living area, I have a Yamaha Aventage RX-A1080 with NHT Absolute Towers, NHT Super Center, NHT iC2ceiling surrounds, and an SVS SB13 Ulta Subwoofer. In the bedroom, I have another 5.1 system driven by an older Yamaha with all NHT speakers (including 10" sub). And, on my PC, it's connected to a small Yamaha receiver with polk audio bookshelves and powered sub. Last edited by R Doug; 10-12-2018 at 10:39 AM. I bet that sounds as good as it looks. My bucket list goal is to have a nice high end reference room for just audio someday (like, when I build our final retirement home).